The mastery of architecture in Tulsa takes no greater form than in Villa Philbrook. This mastery can be seen in every small detail; from the sweeping lines of the grand vestibule to the highly stylized chimera scattered throughout the villa. 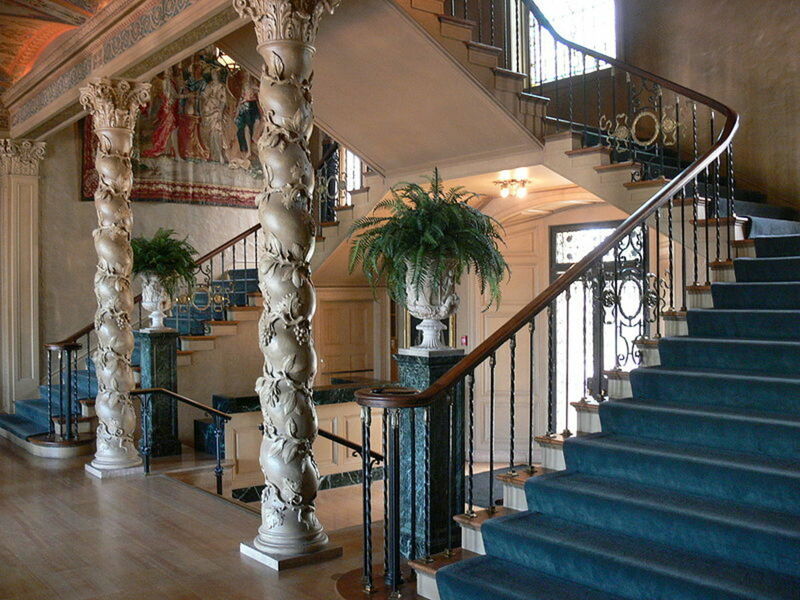 Highly ornate columns straddle the upstairs hallway, adorned with realistic grapevine reliefs. The ceilings soar as if stretching towards the heavens. Even the Ceilings are highly ornamented with fantastic designs. Every brick and stone in this masterful mansion is perfectly placed, leaving nothing to chance. While the Villa Philbrook is masterful, the gardens can only be referred to as simply stunning. Every inch of land is well manicured with lush green grass and vivid flowers. The quiet trickle of water softly accompanies a gentle breeze as it roams about the gardens. Dotted throughout the estate, ornamental statues and fountains add a sense of tranquil peace. One can only imagine the quiet solitude that the Phillips family enjoyed on those warm summer nights. Waite Phillips, with the help of his older brothers, Frank and L.E. Phillips, had become a successful oilman in the early 1900’s. After working with them for eight years, Waite decided to strike out on his own. In 1914, he sold his oil interests to his elder brothers for a tidy profit. Four years later, Waite Phillips left Bartlesville and moved to Tulsa. Phillips bought a considerable amount of land west of Okmulgee. As expected, his team struck rich pools of oil. This discovery quickly vaulted Phillips to the top of the oil game. Soon after his move to Tulsa, he began the Waite Phillips Co. and moved his headquarters to Tulsa. To the south of the fledgling city, Phillips purchased 64 acres of farmland. On this land, he chose 23 acres of prime property to build his new home, the Villa Philbrook. While in Europe, Waite and his wife, Genevieve were greatly impressed by the grand Italian villas they saw. In 1926, Phillips signed a contract with Edward Buehler Delk who spent months studying in Italy and Greece, and could easily relate to the Phillips’ vision. Delk skillfully drew up plans for the villa. Waite was so impressed that he hired to design three major projects at once; the Villa Philbrook, the Villa Philmonte, and the Philtower office building. Shortly after the plans were made, construction began on the Italian Renaissance villa. The John Long Company out of Kansas City was chosen to build the mansion. The John Long Co. used steel framework and reinforced concrete walls and floors to build the shell. Inside, Kasota limestone was used for the walls, doorways, windows, and on top of the floors because it was similar to Italian travertine marble. Edward Delk wanted to surpass all expectations that Waite had placed on him. He commissioned the D’Ancenzo studios of Philadelphia to create the massive stained glass windows in the grand vestibule. The scene in the center window depicts the story of Dante and Beatrice. Delk also commissioned Oscar Back of New York to design the ironwork as well as the columns in the great hall. The ceiling of that hall was painted by Cooper and Gentihomo, famous mural decorators of New York. The ceiling’s motifs were based off authentic Italian Renaissance ceilings. Tulsa landscape contractor Phillip Thomas oversaw the construction of the expansive gardens that surround the Villa Philbrook. Again, the influence of the Italian renaissance hung over every decision that Waite made. He was deeply inspired by the Villa Lante, an Italian country estate north of Rome designed by Giacomo Barozzi da Vignola in 1566. In all, the mansion took a little less than a year to complete. 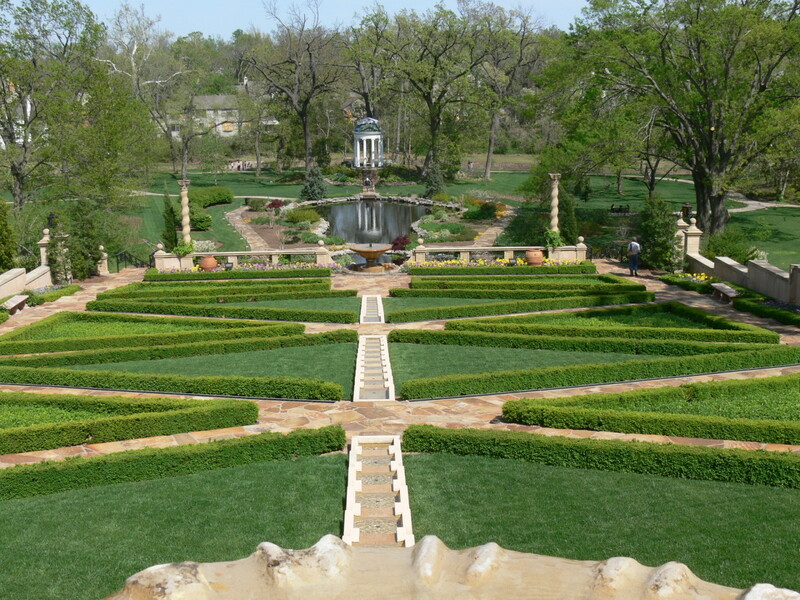 The Villa Philbrook now featured 72 rooms on 23 acres of manicured grounds. According to family friends, Waite created the mansion as a place where their two children could entertain friends. At the time of completion, his daughter, Helen, was sixteen, and his son, Elliott, was ten. The family lived in the mansion until 1938. By then, his children had grown and moved off on their own. Waite decided to move to California, and sold his company for $25 million. Before he left, he gave Tulsa a gift that would never be forgotten.